There are a lot of choices today when deciding which pole is right for you. At there, we offer different shaft materials, grips and locking mechanisms. Our Model No.B221 two-section poles are made from high quality materials and have adjustable heights. The adjustable length of the pole is from 90cm to 150 cm and two diameters of 16cm and 18cm with the weight of 279g. Made of aviation 6061/7075 aluminum alloy or Carbon Fiber, stronger and lighter. Anti-shock spring mechanism. Compass on ergonomic handle with a considerate sponge tip. 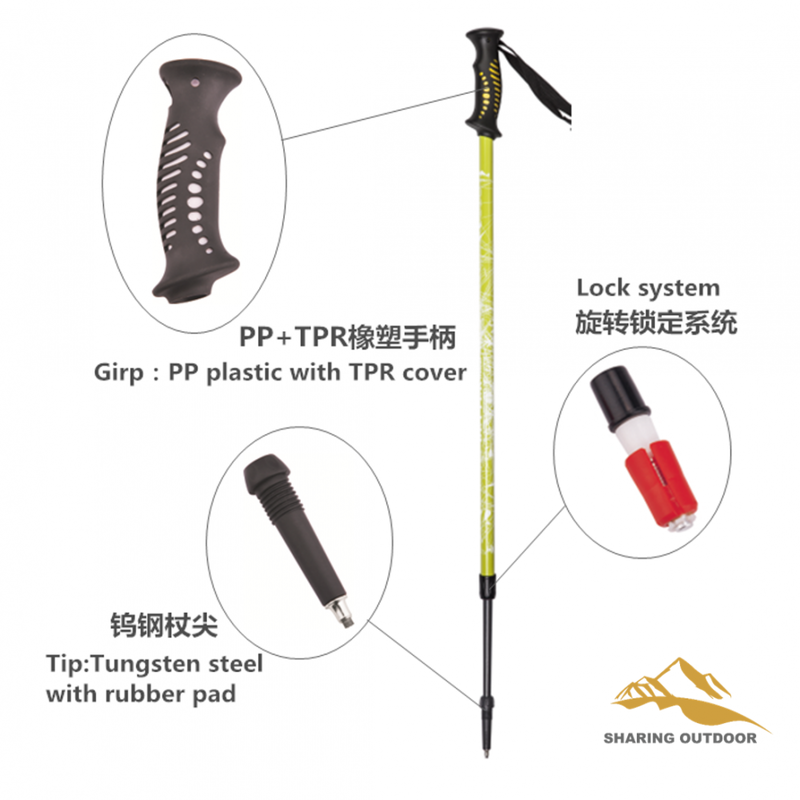 Tungsten Steel Tip is extremely hard and excellent for use on the roughest hiking trails and it provides a more durable option for people who aren't concerned about the weight of the pole. Oxidized or painted surface give it a protection from weathering and corrosion. Our tips are made from durable Tungsten Carbide. Tungsten Carbide tips will hold up for long treks on all type of terrain.The Tungsten Carbide Tip is a durable, general use tip that works for most hikes on dirt and loose gravel. Grooves in the tip grab terrain providing stability and confidence while trekking. The PP plastic with TPR cover helps to lower the vibration with each step and also absorbs moisture. To protect the spine and neck, to improve the heart-lung function, to exercise back and arm muscles, to protect the knee-joint and ankle-joint all need a good quality poles. As a necessary tool for outdoor activities like hiking, mountaineering, traveling, etc, is there a better choice than ours? 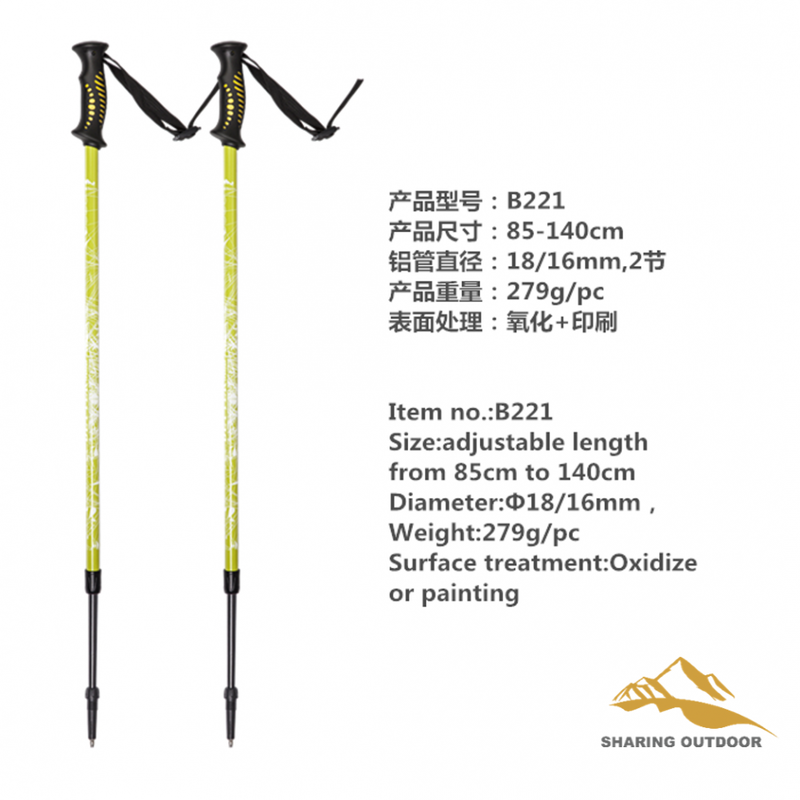 1.Our main products are trekking sticks, Nordic walking sticks and ski poles,etc. Usually,We use high technical material: Aluminium alloy 6061/7075, fiber glass and carbon glass. 2.The materials of grips are CORK, EVA,RUBBER,WOOD, which can make you hold the pole comfortable and safety. 3.We can mark the logo according to your design or your demand, the color of the pole is optional. Normally,we adopt silk printing and heat transfer printing. 4.The grip is made of EVA,CORK, RUBBER,WOOD,ETC. with the adjustable wrist straps,and the tip is made of Tungsten steel,carbide. 5.About the samples,we can make free of charge on basis of you pay the freight..We can finish them within 3-5 working days if everything is under control. 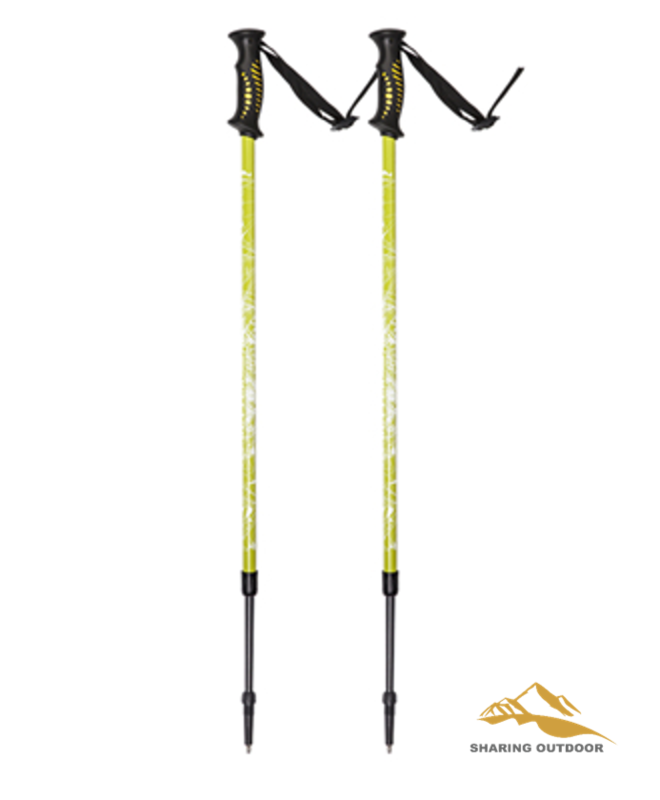 Looking for ideal Nordic Walking Stick 1 Pair Manufacturer & supplier ? We have a wide selection at great prices to help you get creative. All the Painted Walking Stick 1 Pair are quality guaranteed. 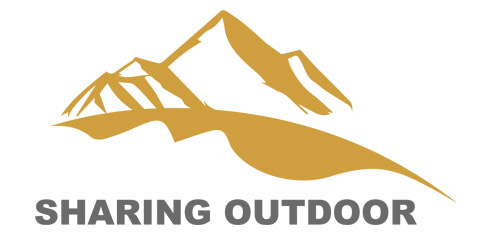 We are China Origin Factory of Trekking Folding Hiking Poles. If you have any question, please feel free to contact us.